Sorry this offer is no longer available, but you can still save 20% on your DiscountMags.com order when you use the code CHEAPSKATE at checkout. 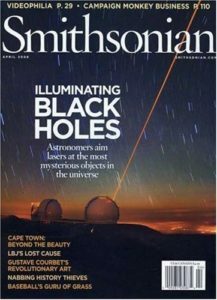 Get one year of Smithsonian Magazine for only $8.99 per year. That’s more than 50% off! Just enter the coupon code CHEAPSKATE before 11:59 p.m. EST on Thursday, November 7, 2013 to get this great deal. Each issue of Smithsonian Magazine is filled with beautiful images, fascinating stories from around the world, and in-depth explorations of history, people, nature, science, travel and the arts. This magazine would make a spectacular gift for anyone interested in history, science, arts and culture. Thanks so much for this! I have been a subscriber to your blog for a looong time, and often take advantage of the magazine discounts you have occasionally posted. This one in particular I thought I’d better finally tell you how much I appreciate these–what a deal! Thank you again…. I’m glad I could help! Thanks for being a subscriber!